In the Japanese culture, Aburakusasu is referred to both sides of the sacred, good and evil, altogether, as an indivisible characteristic of life and human beings. Chosen as the title of the film, it depicts the ups and downs of Jonen, a Budhist monk in the middle of his own 40-year-old crisis. Apparently with a happy family and appreciated by the villagers for his job at the temple, he is psychologically unstable and dependant on antidepressants. 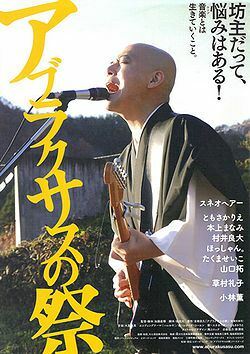 The remembrance of his past years of college student and amateur musician becomes an obsession, until he decides to perform a hard-rock live concert in the small village, with the consequent astonishment of family, superior monk and people around him, youngsters and obaachan included. This movie deals with the stale themes of high expectations- deception, societal rules, suicide, and so on, but with an original approach, from the point of view of a Japanese monk, showing his humanity in terms of weakness -bordering on mental illness. There is quite an artistic photography and a well achieved scene –my favorite- of the main character, naked, in ontological search of himself and multiplied by many mirrors in the room. With many points in common with last year’s Solanin, this one gives us a slightly more optimistic view of life, with its good and its not-that-good things. The final message is unclear, though. But I wonder if it intends to be: do as you please even if your dreams don’t become true.